After reading the headline to this article, you’re surely asking yourself: “the manufacturer’s a little borderline?? ?” We’ll explain ourselves in the review below, as we test-drive this luxurious-looking DAC with its two headphone plugs and its ability to function as a headphone amp for a smartphone or portable player which can be connected with any analogue line. The Tangent brand comes from Denmark, the home of the famous Bang & Olufsen, so it?s no surprise that Tangent takes particular care of its products, like the Fjord system (a dock with a CD reader, FM radio, digital radio, clock and alarm), whose design is signed as Jacob Jensen and which was decorated at the 2012 Design Awards. Tangent is also quite well known for its small Evo speakers, as well as for its cheap electronics, which are designed and constructed with a seriousness and a respect for good sound quality (which we?ve seen first-hand over the course of test benches we did in a former life before Qobuz), and also its ranges of radios and retro radios. 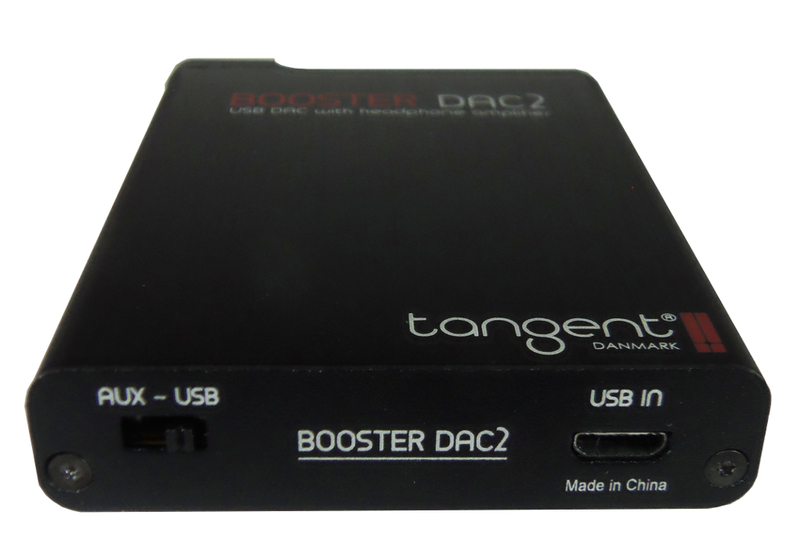 After being slightly slow out of the starting blocks with DACs (as many other brands have been), Tangent has launched two digital-analogue converters, the Booster DAC USB1, which comes in USB key format; and the Booster DAC2 (the subject of this test bench), which comes in an elegant casing and which is pretty small itself. According to the maker, these two models have a resolution of 24 bits at 192kHz, a figure we shall return to. Weight-loss tips would be wasted on the positively skinny 13mm-thick Booster DAC2, which has a neat design, with a protrusion on the right side of the front panel which houses the knurled volume control knob. This product has an undeniably luxuriant feel with its brushed black anodised aluminium casing. Headphones can be connected via the 3.5mm jack plugs on the left side of the front panel, while an analogue source such as a smartphone can be plugged in next to the volume knob, in order to ?boost? the sound level if it isn?t sufficient on its own. In that case, the little slider on the back needs to be set to ?Aux?. A little two-coloured diode in the middle of the front panel lights up green when the device is on, red when the battery is charging via the USB port, and turns off when the device is set to ?off? and the battery is charged. We salute the generosity of the maker who provided various accessories that come with this DAC, including in-ear earphones ? but these cannot make up for the ?hush-hush? approach to branding, which we will explain below. Nothing is more frustrating for a tester who is passionate about technology than to discover that the markings on the components have been removed inside a device, after you have meticulously taken it apart in order to glean the secrets of its construction! We are told that this is a means for constructors to protect themselves: it is indeed their right ? just as it is the right of a potential buyer to know what the desired product contains: and the right of Qobuz to be able to inform them. We once refused to review a product for this reason (but not just for this reason: the product stubbornly resisted all our attempts to make it work, and refused to emit a single sound), and we came very close to making the same decision when it came to the Booster DAC2. However! Having opened up the DAC, we managed to recognise the anatomy of the beast within, and we believe that ? in spite of the removal of their markings ? we can identify the built-in circuits with a decent degree of certainty. Straight away, the presence of a single 12MHz quartz indicates that the USB interface circuit is synchronous. 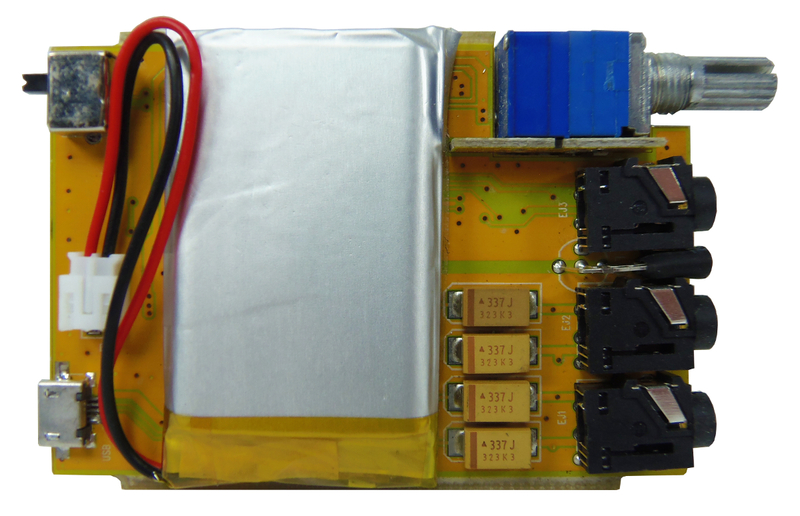 Moreover, this comes in a 28-pin SSOP CMS housing with the quartz between pins 1 and 28, and the power lines and outlets correspond to those used in the Texas Instruments PCM2704 circuit. It seems to us, then, that it?s most likely that this circuit with the markings removed was a PCM2704 (which, unluckily for Tangent, we happened across in another product this week), a circuit which can only read digital files up to 16-bit at 48KHz and which contains a digital-analogue converter inside its housing. 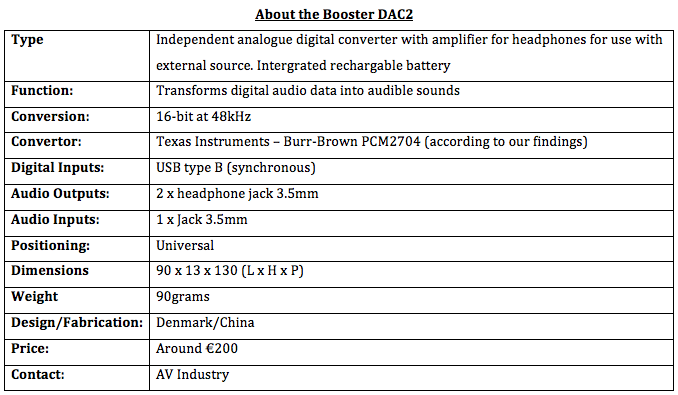 What annoys us is not that that the Booster DAC2 is using (presumably) a PCM2704 (there is no shame in that), but that the DAC?s product file talks about a 24-bit/192kHz resolution, which information can also be found in online shop outlets and in promotional materials in France and abroad: and that Tangent boasts pretty much at the start of this same product file that The digital/analogue conversion components used in the Booser [sic] DAC USB2 are state of the art, which seems to not be the case at all. And why remove the markings? 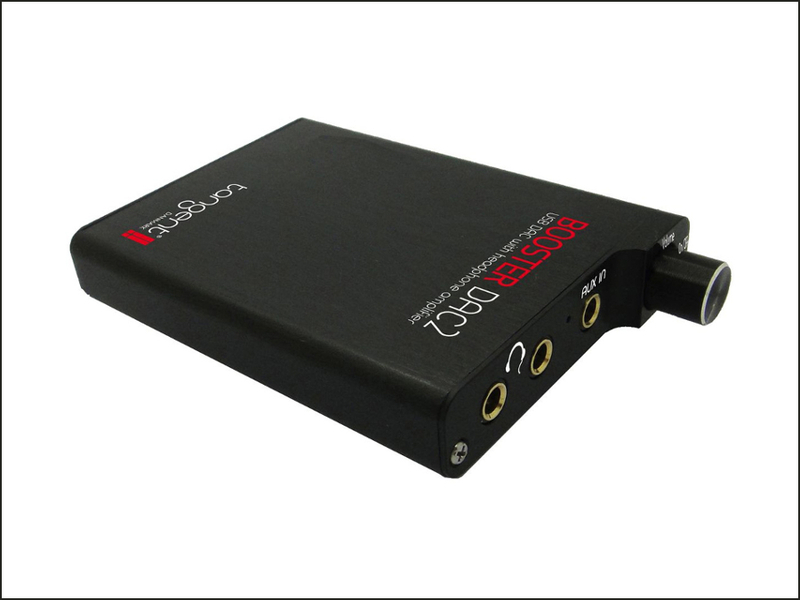 And if one day a Qobuz client should download a 24-bit at 192kHz Studio Masters file and can?t play it on their Booster DAC2, it?s certainly Qobuz who will get the blame (and the insults)! Likewise, we were able to identify the headphone amplifier (the chip in the eight-pin box), because there was a hint of a marking still visible which closely resembled the TDA1308, an integrated amplification circuit for headphones made by Philips, consisting of MosFet technology, and which offers very good sound performance. Everything else is put together neatly; the potentiometer with an ON/OFF switch which ultimately seems to be of good quality, and the headphone link is achieved (due to limited room) by using tantalum capacitators mounted on the surface, of 330 ?F (mounted on the battery side), a level which guarantees a cutoff frequency of around 15Hz at the low end of the range, with a headphone with an impedance of 32 ? and 30Hz if two 32 ? headphones are connected, which will not deprive either of them of the deepest bass notes (insofar as they are capable of reproducing them). 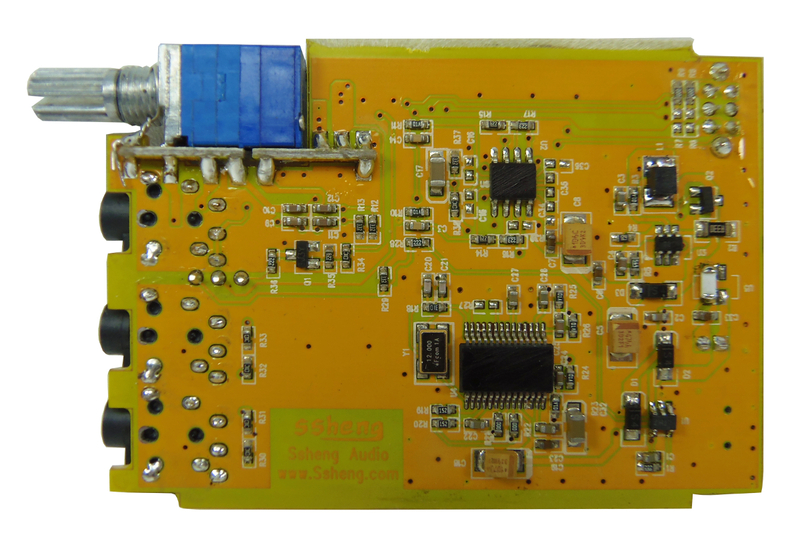 The Tangent Booster DAC2 doesn?t require the installation of a driver and appears as ?USB Audio DAC? 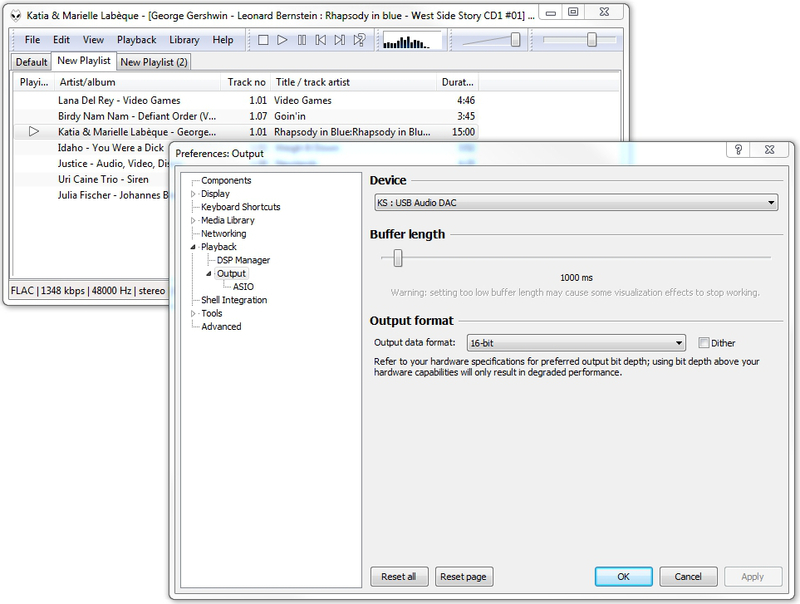 in the list of audio peripherals and can function in Kernel Streaming mode (KS) and, stunningly, it can read 24-bit files at 44.1 and 48kHz by means of reducing the 24-bit signals to 16-bit, as the reader software programme requires 16-bit material. To start off with, a note on the headphone amp which we used by connecting it to the output line of an amplifier with the Sony UDA-1. Once again, Fantasia on British Sea Songs by Henry Wood served as our test piece. With the in-ear headphones which came with the DAC, the sound restitution was not exactly phenomenal, and so we switched to the Focal Spirit One Qobuz Edition, which provides a decent quality sound. Precision, an ?open? soundstage and a well-balanced sound message, as well as good sound dynamics mean that this device has no problem delivering a convincing rendition of various pieces of Henry Wood?s work, and one can obtain quite high sound levels without any problems. 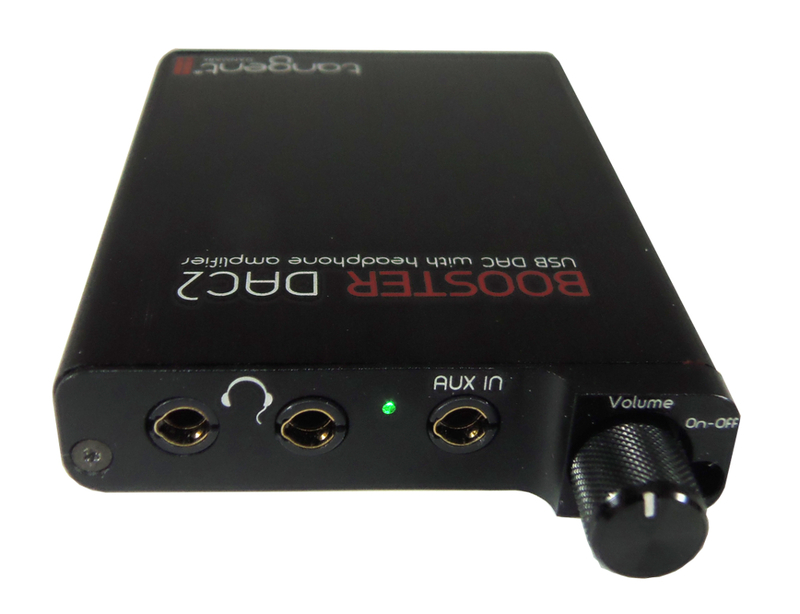 With its internal converter, the Tangent Booster DAC2 offers a sound restitution which keeps to the straight and narrow and never tips over into excess. The definition certainly does not reach the highest summits, but overall the sound is clear and one will note that it follows the dynamics of the sound particularly well, probably thanks to the use of battery power. The track The Upsetter from the album Loveletters by Metronomy is positively glorified by the Booster DAC2, which lends it an extra layer of subtlety and accentuates its analogue sound in a way which it very pleasant to listen to, without hurting your ears. Roar from Prism by Katy Perry isn?t bad either, where the presence, dynamic and an impressive bass performance compete to outdo each other in creating musical pleasure. In summary, we can?t accept Tangent?s outlook, or its behaviour, seemingly linked to this outlook, which is aimed at preventing the identification of components used in the Booster DAC2. That said, we don?t want to denigrate or bring down this device, which offers perfectly decent sound performance and also doubles as a very serviceable portable headphone amplifier - all in a very small package and with a luxuriant design. Marantz HD-DAC1: a delight for the eyes and ears! Beyerdynamic A 200 p portable DAC / headphone amplifier: compact but extremely versatile!